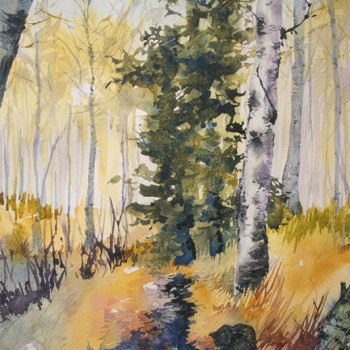 Canadian watercolor artist Angela Fehr is an art instructor and teaches art online and locally in British Columbia. "I’ve created art since I was very young. Most teens reach a stage where they grow very self-critical, and it’s then that they will either quit creating, or push harder to find solutions. My dissatisfaction with my artistic ability as a teen drove me to my first watercolour class, and from there my passion for watercolour was born". I’ve created art since I was very young. Most teens reach a stage where they grow very self-critical, and it’s then that they will either quit creating, or push harder to find solutions. My dissatisfaction with my artistic ability as a teen drove me to my first watercolour class, and from there my passion for watercolour was born. I never know in the moment if a painting is complete or not; watercolourists have a tendency to fuss over details, so I try to only paint as long as I feel loose & relaxed, then take breaks to refresh my insight and give me a fresh perspective on the painting. If it makes me happy, it’s done! I love painting my experiences, not the highs of euphoria, but the quiet peace of enjoying simple beauty in the Peace River region where I live in northern British Columbia, and the fulfilling abundance of time spent with family. Nature reflects personal truth in so many ways, and I love impressing senses of peace and joy into my work. My husband is a carpenter, and together we created a vintage style studio on our acreage. It’s full of creative details and was a labour of love that makes me so happy to work in! I’m primarily a watercolourist, and I am inspired by painting nature, while adding my own abstract twist. I’ve been teaching art at my children’s school, and it has been so fun to experiment with different mediums with the students! My favourite recent project was block printing, and I find mono-printing so fascinatingly creative. I rarely have time to take classes, but when I do, I look for watercolour masters whose style is different than mine. It’s always exciting to try something new! I teach full time via my online classes at https://learn.angelafehr.com It’s important to me to help students stay encouraged as they learn to manage watercolour, so a big part of my message to is to trust the process and know that every painting session is making you a better painter. I’m excited to be teaching in Ireland at a dream destination workshop in September 2018. I enjoy painting en plein air, but in the north the weather doesn’t always cooperate. It’s definitely harder, as there are many more distractions, but the lessons learned are invaluable. No, commissions are not something I offer. Vincent Van Gogh - There is nothing more artistic than to love people. I love that teaching gives me the opportunity to engage with and love people, creating community and it just makes my love of painting come full circle. Jean Haines is a watercolourist from the UK. Her loose style is brimful with a passion for watercolour, and gorgeous looseness. She really trusts her viewers to see the beauty in art that some might consider “messy” or “unfinished.” I was able to take a workshop with Jean in 2016 which was delightful. 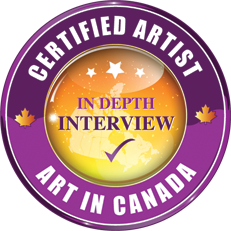 Did they inspire you to pursue a career as a professional artist? I was already pursuing art professionally, but when I discovered her about 5 years ago, it marked a turning point in my art. Through Jean’s work, I realized it was okay to paint solely to please myself, to pour into my art my love for watercolour and trust my audience to understand and love the result. There’s always a fear of the unknown, not being sure I know what I’m doing. But lately, that fear is far overshadowed by the thrill of not knowing what is going to happen, but trusting it will be magical! Take time to learn. Relax into the process of growing your skills. In growing your career, it’s like climbing a mountain. Take one step at a time, do a little every day, and be patient. You will see results, even if you can’t see the top of the mountain from where you are standing. The fact that I’ve gotten this far already. I had no idea that I would be able to be a full time artist when I started, and to see how much I have achieved, simply by setting small goals and working toward them is a huge motivator as I set new goals and keep moving forward. My camera, my palette full of paint, my favourite watercolour papers. My favourite brush. Today it’s a river landscape that holds sentimental meaning; it’s a hill near my grandparents’ home that has been the route of many family outings. Tomorrow it might be something newly created that gives me a special thrill. My “Silver Valley Sentinel” watercolour is a portrait of a frosty aspen tree, also from near my grandparents’ home. It received People’s Choice when I exhibited it with the Peace River Chapter of the Federation of Canadian Artists last year. I have to mention the Dawson Creek Art Gallery, here in my hometown of Dawson Creek, British Columbia. The Gallery has supported me, shown my work, and cheered me on for over 20 years. Housed in a retired grain elevator, it’s a landmark building and a beautiful place to exhibit art.